One thing that has irritated me for a long while is that the search box in the top right of the finder window in mac osx defaults to searching my whole mac, and not the folder I'm currently looking at. If I wanted to search the whole Mac I'd use the Spotlight search wouldn't I Mr Jobs? Anyway, I just discovered that it's possible to change this behaviour. Open Finder, go to the menu and choose Finder / Preferences / Advanced, and select 'When performing a search: Search the current folder". Now I just need to find a way to make it search by FIle name and not file contents. 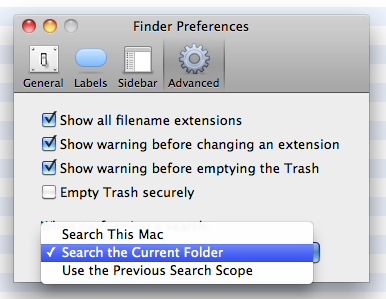 EDIT: Apparently there is no way of defaulting to search by file name in Snow Leopard. However, in finder you press CMD-SHIFT-F, then it will put the cursor in the search panel, and set it to search by file name. Not too bad at all!